How to Recover Lost Photos from Formatted Micro SD Card? Summary: Lost important photos from your formatted SD card? It is no big deal! This passage tells you how to easily and quickly restore photos from formatted SD card within simple clicks! Micro SD Card is a kind of tiny flash memory card, which is originally used in mobile phone. But with the improvement of its storage capacity and thanks to its small size, it has been used in the GPS devices, portable music players and some other flash memory disk. As the smallest memory card so far, the size of Micro SD card is 15mmx11mmx1mm with storage capacity of 128MB, 256MB, 512MB, 1G, 16G, 32G and 64G. Massive data can be stored in such tiny card and it is able to bring fast and reliable data transmission through a specialized serial interface. For some reasons, you have to format your Micro SD card. After formatting, the hard drive can be divided clearly according to the cylinder, track and sector, so that we can take use of the hard disk space more effective, find the target files more convenient and get a more accurate location. You may find data were lost after the card formatting but it is no need to panic because formatting didn’t do any operation on data area. The directory is empty but the content is still here. With the help of professional Data Recovery software, you can still get back the lost data. 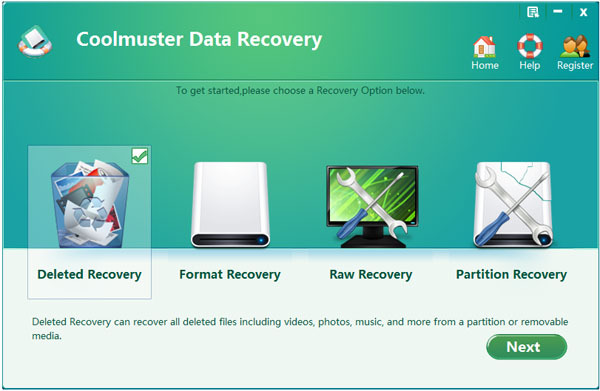 You can utilize Coolmuster Data Recovery to help you perform the Micro SD recovery. As its name implies, it can recover lost, deleted, formatted and even corrupted photos, videos, music, documents and more from Micro SD card. It performs safe and read-only operations in the memory without doing any harm with the original data. It is dedicated in recover all types of lost data from any storage devices without any quality loss. In the very beginning, you should download the Windows version of the Micro SD Recovery software to get ready. Just insert your Micro SD card into a card reader and connect the card reader to your Windows PC. If your card is in your mobile phone, you can also connect your phone to the computer via a USB cable directly. 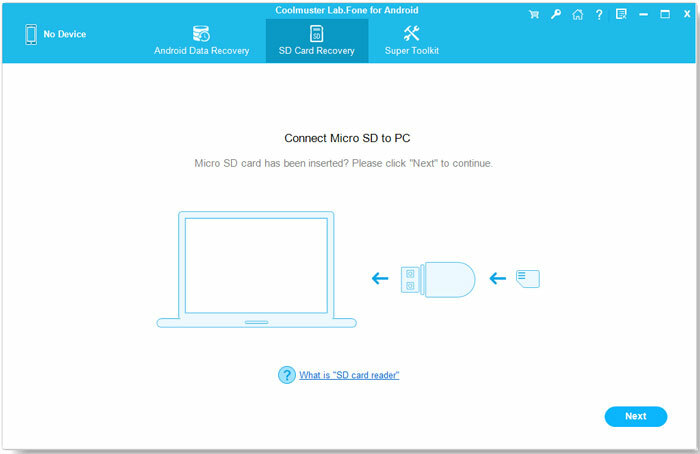 Launch the installed Coolmuster Data Recovery and choose a recovery mode and Click "Start" to let the software detect your Micro SD card. Highlight the drive of your card and scan for all the files, including the lost photos in the card. Then, select the photos you need and begin the photo recovery. If you are a Mac owner and want to perform the Micro SD recovery on your Mac, we provide Data Recovery for Mac to help you. With the same capability of the Windows version, the Mac version can also recover photos from Micro SD card without any hassle. Almost all card types, including SD card, MicroSD, SDHC, CF Card, xD Picture Card, Memory Stick and more, can be supported by this data recovery software. The operations on Mac version are similar to that on Windows. 1: Connect your Micro SD card to Mac, launch the software and choose a recovery mode for Micro SD recovery on Mac. 2. Highlight your Micro SD card and scan for the lost photos. 3. Preview and select the files you want to recover and kick off the recovering process. Part III: How to Recover Lost Photos from Android SD Card? For SD card in Android mobile phones, you can depend on Coolmuster Lab. 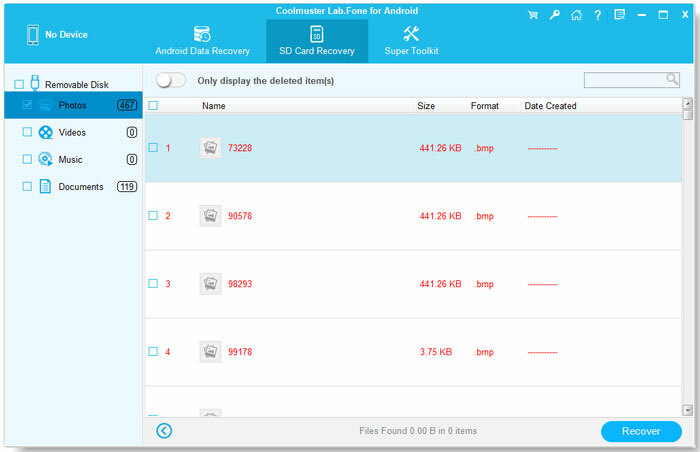 Fone for Android or Coolmuster Lab.Fone for Android (Mac), which can recover deleted and lost photos from SD card in Android phone. First of all, you need to download the program on your computer. Just choose the right version according to your computer system. Then, read the step-by-step guide below to learn how to get back deleted photos from Android SD card. 1. Download, install and launch the software on your PC or Mac. Connect your Android phone to the computer with a USB cable. Then choose the Android SD Card Recovery mode to continue the process. 2. When your Android SD card is detected, the program will show it on the screen with name and capacity. To recover photos, you should choose "Photos" category to open it. 3. Select the photos you want back and then click the "Recover" button to begin the recovery process. Extra: Do You Use Your Micro SD Card Correctly? How to correctly use your Micro SD card so that you can prolong its usage life? Here we give some useful tips. We know some mobile phones can only support the memory card with corresponding capacity and some phones have bad compatibility with specified card. That’s why we need to consult the relevant technicist. Never buy a 1G card if you have a phone that only supports 512M card capacity. We suggest sparse use of your card when the battery is low and do not pull out the card when you read or write data on the card.